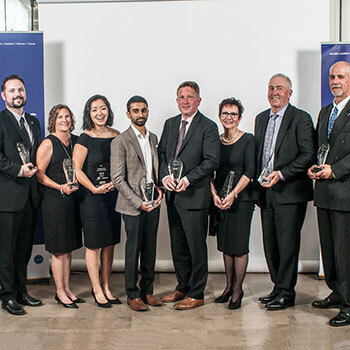 On Saturday, Sept. 30, Wilfrid Laurier University’s Lazaridis School of Business and Economics celebrated nine graduates for their outstanding achievements at its fifth annual Lazaridis School Alumni Awards Gala over Homecoming weekend. The awards ceremony took place in the newly opened Lazaridis Hall on the Waterloo campus. Presented by Lynn and Tom Oldfield. Dan Einwechter (BBA '77), Chairman and CEO, Challenger Motor Freight Inc. Presented by TD Canada Trust. The annual Lazaridis School Alumni Awards program celebrates alumni who have consistently demonstrated outstanding achievements in community service, career accomplishments and giving back to the Laurier community. Over 200 alumni, faculty, staff and industry leaders attended this year’s gala to honour the Lazaridis School Alumni Award recipients.